The BARBARA project aims to develop new bio-based materials with innovative functionalities through fused filament fabrication (3D-printing). Food waste and agricultural by-products will be used to purify pigments, fragrances, reinforcing agents or biocide compounds, which will be incorporated into engineered bioplastics derived from corn processing industries. These new materials will be transformed into prototypes with customized porperties (mechanical and thermal resistance, surface or colour appearance, fragrance release or self-sanitizing surfaces) to be validated for their use in two highly demanding sectors such as the construction and automotive industry. Demonstrator prototypes of door handles and dashboard fascia for cars with specific colours, fragrances, surface effects and antimicrobial capacities will be 3D-printed in collaboration with Centro Ricerche Fiat. Moulds for Resin Transfer Moulding and truss joint prototypes will be developed to suit the strict thermal and mechanical requirements of pieces used in the building sector by ACCIONA Infrastructures. The target of project BARBARA is the development of novel bio-based engineering bioplastic materials to be validated as functional prototypes with advanced properties for the building and automotive sectors. The first article related to the project is published in form of a review in "Carbohydrate Polymers"
As the project progresses, members from KTH and TECNO packaging have recently published a review on the prestigious journal "Carbohydrate Polymers", dealing with the compatibilization of polysaccharides and bio based polymers. This review critically explores the current status and the future outlook of reactive compatibilization strategies of the most common plant polysaccharides in blends with bio-based polymers. The main regional news media provider and newspaper "HERALDO" has selected Project BARBARA as finalist in the fourth edition of the Third Millennium Awards, an event whose objective is to recognize the work of people, centers and research groups, institutions and companies in Aragon. The project opts to the award in the category of "Research and Future". The price is awarded to the most prestigious projects combining research, divulgation and innovation. The impact and popularity of project Barbara has trascended the regional and local TV news in Belgium. Thanks to the event of the 3rd Consortium Meeting, demostrator shows and interviews were given to local and regional press, which resulted in several news articles. The Belgian TV "Vedia" used the opportunity during the 3rd Consortium meeting at the premises in CELABOR to perform a full coverage review on the local TV channel and their on-line platforms. 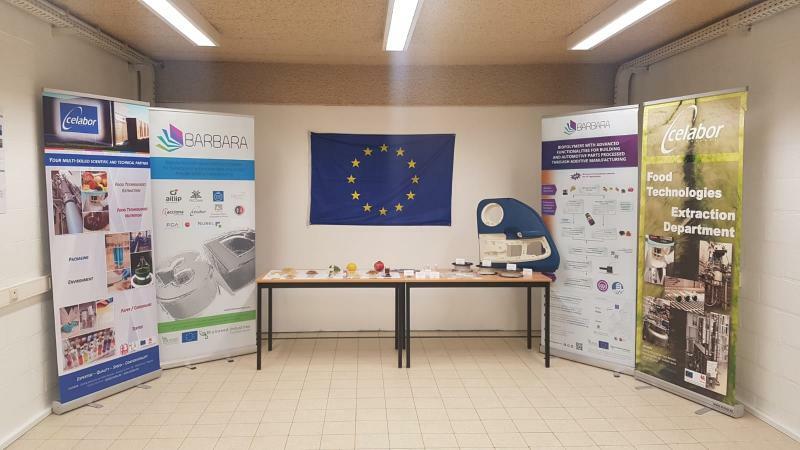 The 3rd consortium meeting in the Barbara project took place this November 20-21st at the premises of CELABOR (Herve, Belgium), key partner in the up-scaling of products from work packages 1 and 2. All partners were gathered in this event, as to put together the results so far and plan for the future of the project, at this mid-stage of the life span of project Barbara.